Sean Dyche's heart goes out to former Claret Danny Ings after news of his season-ending cruciate knee ligament injury. Just two days after making his senior England debut as a second half substitute for Harry Kane in Lithuania, Ings suffered the injury all footballers fear in his first training session back at the Reds' Melwood training base, under the watchful eye of new boss Jurgen Klopp. 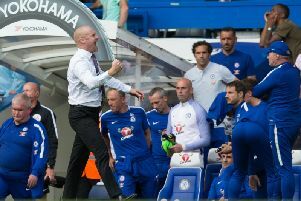 But Dyche, who has seen five of his players at Burnley suffer similar injuries in the last 18 months, feels he can bounce back strongly: "I’m really disappointed for him but he’s developed so well with us here and knows so much about his fitness, his body and his nutrition – all things that will help him on his recovery. "The thing about those injuries is that you want the positivity of moving forward. "He’ll know the immediate stage and he’s got people here who’ve been through it. "It’s a shame as people were talking about how well he’d done and how Liverpool looked better with him in the team. "You could only imagine that pointed to a good future with a new manager, it certainly did with the departed one. While Burnley have seen Sam Vokes, Kevin Long, Dean Marney, Ashley Barnes and Lukas Jutkiewicz suffer similar injuries of late, there have been a spate in the Premier League - six in four weeks, and Dyche added: "I’m sure Eddie (Howe) at Bournemouth is scratching his head as he had three in four weeks and we looked into the ones we had here. "We looked at pitches, boots, training regimes and in our instances you can’t help but think a lot of it is chance. "We’ve had the medical team in, looked at them in slo-mo and different views and you can’t help but think there’s not a lot that could’ve been done. "For ours its quite apparent how fit the players are, so it’s a head-scratcher when you get this amount of cruciate injuries."